The last of three budget proposals for next year was presented in Lansing yesterday. On Wednesday, the Senate appropriations subcommittee on school aid endorsed its chairman's budget proposal, just as the corresponding House committee had done the day before. These two proposals join Gov. Snyder's proposed budget, offered in February. Now we enter the second act. As is so often the case, the public portion of these proceedings resembles theater more than open discussion. The Governor proposes his budget with much fanfare to a joint meeting of the legislative appropriations committees. Then the subcommittees begin their work, going through the motions of asking invited guests to proffer advice. But during this time, backroom negotiations ensue, out of the pubic eye. This week, to get the budgets off their plates before the legislature's spring break, the subcommittees met again. The results of the backroom negotiations were rolled out, admired, subjected to some pro-forma criticism from the opposing party, and in due course approved and sent on their way to the full appropriations committees. All according to the script. The public was definitely NOT invited to participate. The outcome was never in doubt. These competing proposals are really the opening offers in a game of political "Pit" which will also take place mostly out of the public eye. No one but well-heeled lobbyists are invited. But we end up living the consequences of the horse-trading we cannot see. included provisions that expand the state's ability to intervene in districts under financial stress (which failed to pass last year). While the Governor's proposal had many positive elements, the shifting of funds meant that some districts would actually see a cut in per-pupil funding. 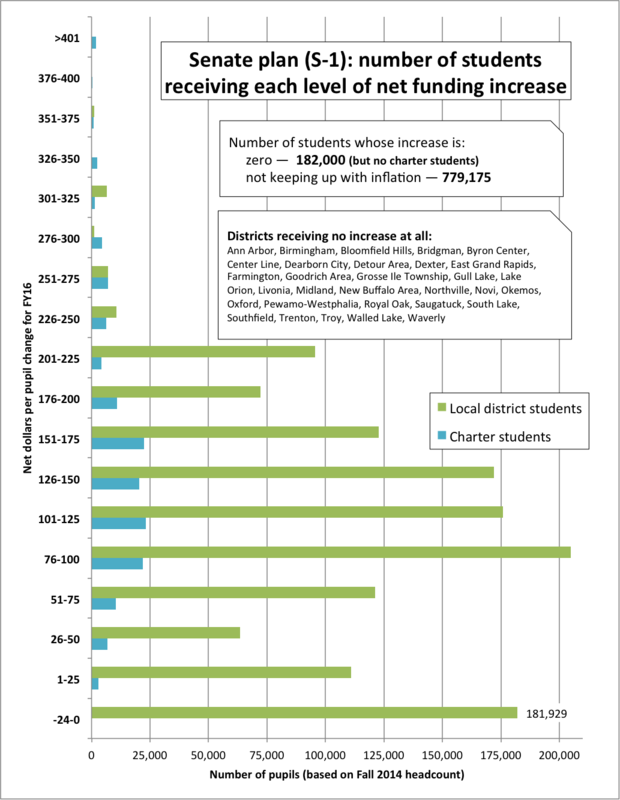 More than 151,000 students live in districts which would get a cut or no increase under the executive proposal; 726,000 would receive less than the advertised $75 increase. For students living in poverty, it means 22,000 would get a zero increase or a cut and 192,000 would get less than the $75 increase. 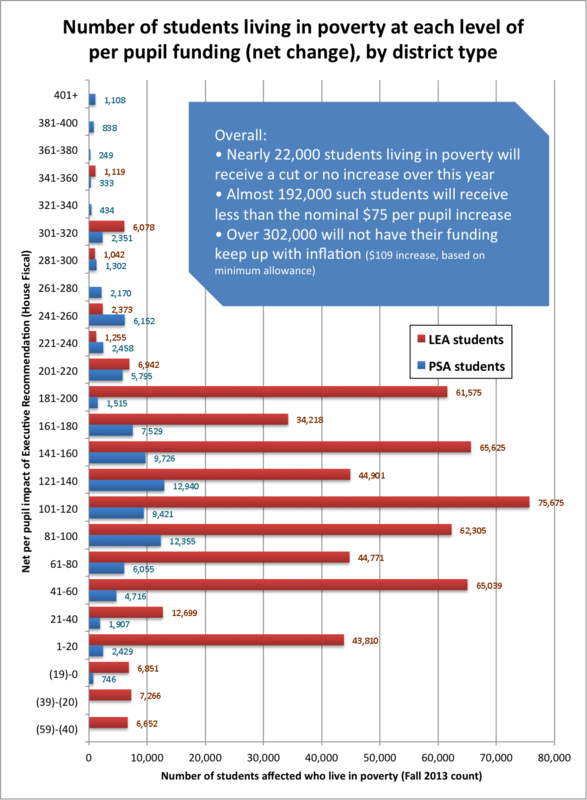 Some 992,000 students (302,000 in poverty) would not have their funding keep up with inflation. Appropriates $5 million to compensate private schools for expenses required by education law. 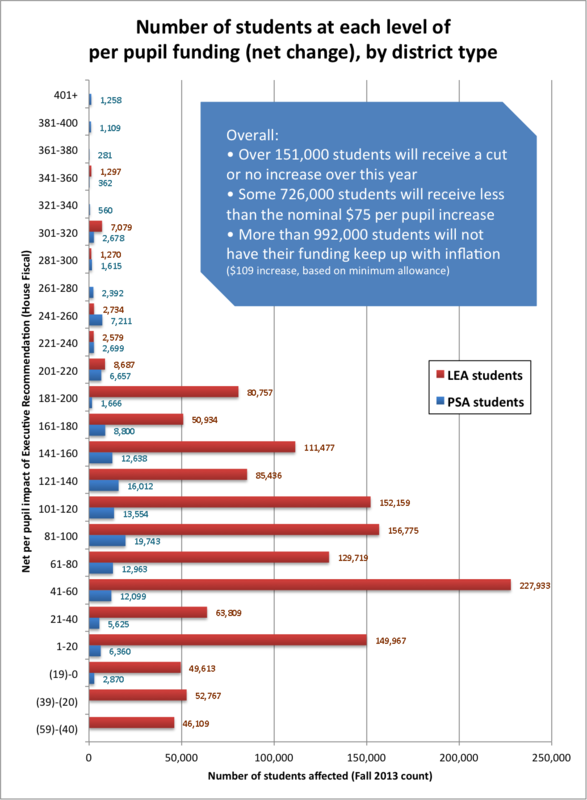 While the House proposal appears to be more generous on the surface, the larger per-pupil amounts come at a cost. Several of the Governor's better initiatives, especially increased at-risk funding, were removed from the House proposal. Moreover, assistance to districts with retirement costs was cut in half. This ends up benefiting charter schools (few of which participate in the state retirement system) and increasing the burden on local districts. 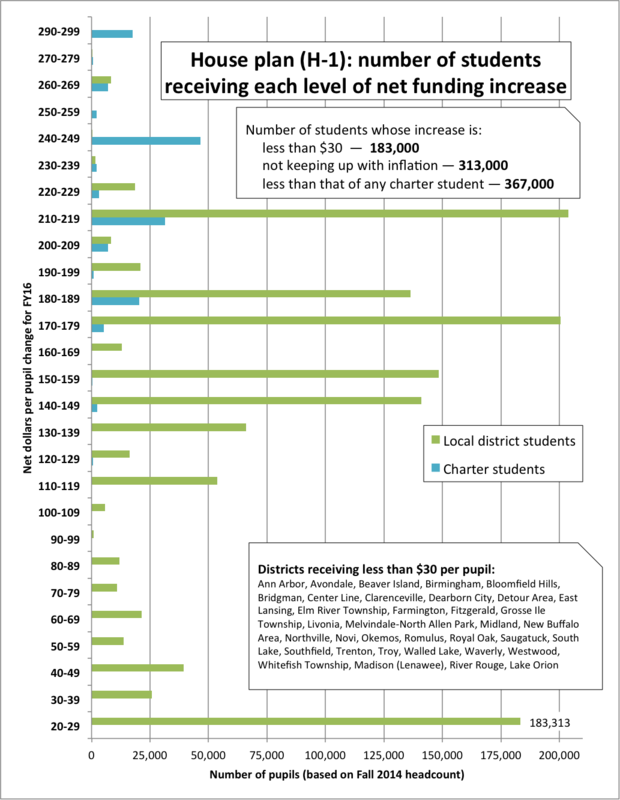 So, while the smallest per-pupil increase appears to be $137, in fact many districts will get the minimum $25. About 183,000 children attend schools which will get less than $30 additional per pupil, almost 53,000 of them living in poverty. But no charter school will receive that little. Some 313,000 students will not have their funding keep up with inflation, including over 94,000 living in poverty. 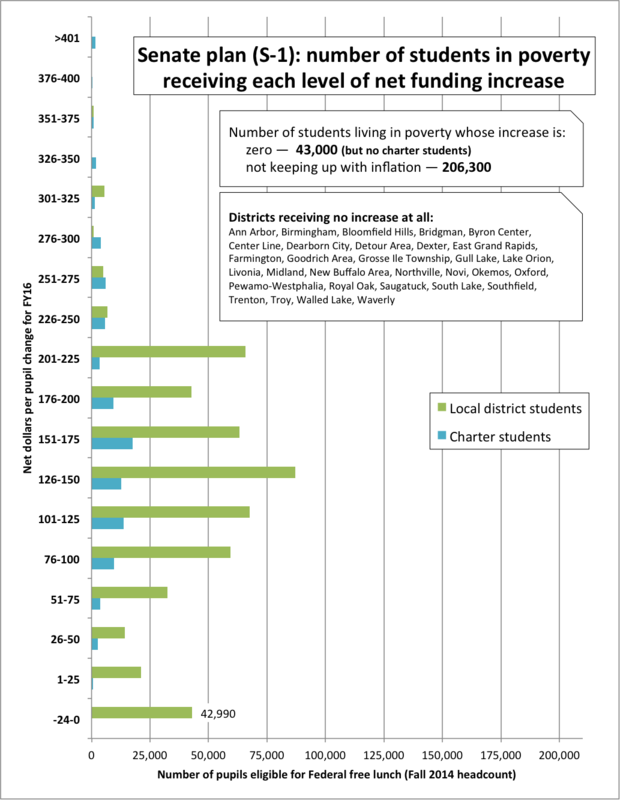 Again, no charter students will have their funding lag inflation. 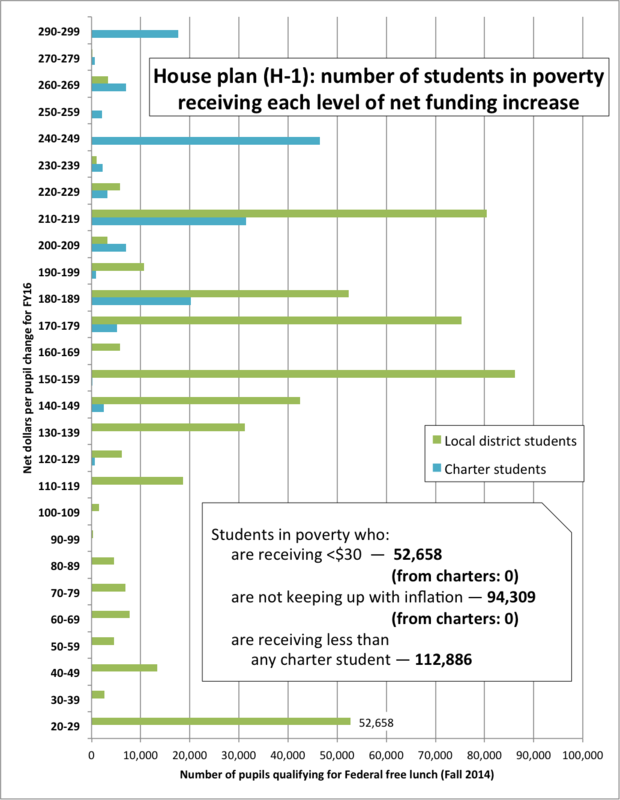 In fact, 367,000 students in community school districts (113,000 living in poverty) will receive a smaller funding increase than any charter student. Not all funding formulas are created equal. Adds funds to governor's proposal to fund extra literacy instruction time in kindergarten, but removes some other related measures. The net effect of the Senate's changes are to prevent any district from taking a loss, and prioritizing lower-funded districts for per-pupil increases. Even so, 182,000 students would see no increase under the Senate plan (of which 43,000 are living in poverty), all of them in local pubic school districts. Almost 780,000 would have their funding fall behind inflation, of which 206,000 are in poverty. None of these plans represents the final word. If history is any guide, the end result is likely to look more like the Senate (and thus the Governor's) plan, with elements of the House plan included. But don't expect to find out for sure until the deals have already been cut. That's why it is so important for parents to be heard now, so lawmakers will have their voices in mind as they do their backroom dealing for a final budget document.